Rosary bracelets make for a great gift as they are attractive to wear and practical too as it is a much smaller version of a full size rosary. St Michael archangel Blue rosary bracelet is a One Decade Rosary. The handmade unique St Michael archangel Blue rosary bracelet is inspired from the traditional Catholic One decade Rosary Design. 10 "Hail Mary" blue color glass Pearl beads 8mm size are paired with 1 large "Our Father" turquoise blue Swarovski crystal bead, creating a piece that is classic, yet trendy and stylish. The Rosary bracelet is strung onto tigers tail wire for strength, durability and drape. Finished off with the silver St. Michael the Archangel pendant, a silver Four Way Cross , and an ornamental toggle clasp. The pendant is approximately 1 inches long. The silver cross is approximately 1.25 inches long. The St Michael archangel Blue rosary bracelet is approximately 7.75 inches long. 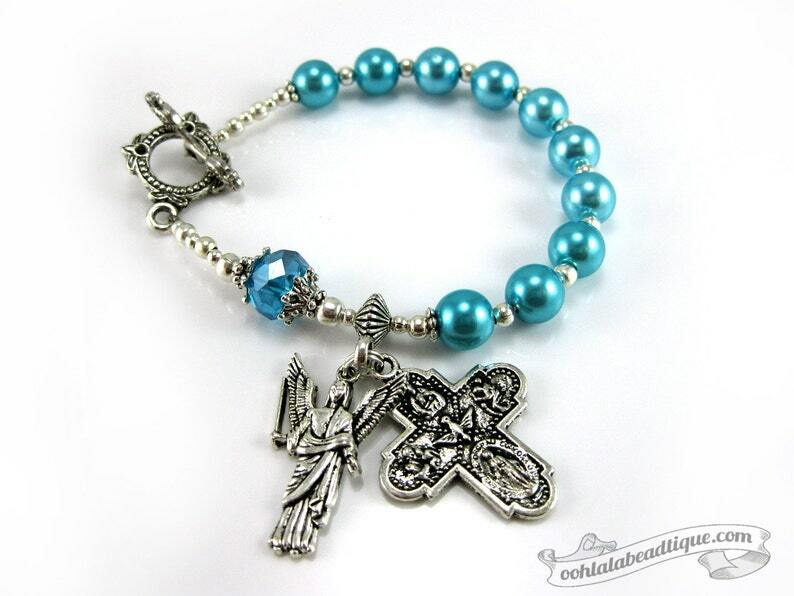 The St Michael archangel Blue rosary bracelet will best fit wrists measuring 6 to 7 inches. In Catholic tradition, a four-way cross combines four devotional images. The top image is that of the sacred heart of Jesus, with Christ pointing to His heart. This is devotion to Christ’s physical heart as the representation of His divine love and compassion for humanity. The lower image is miraculous, depicting the Virgin Mother and these words: “O Mary conceived without sin pray for us who have recourse to thee.” It is also called medal of the Immaculate Conception, originated by St. Catherine Labouré after her vision of the Virgin Mary in 1830. St. Christopher is depicted on the left. He is known by many as the protector of travelers. Some traditions say that he was a man of great strength whose livelihood was carrying people across a raging river – he is said to have carried the child Christ across one day. St. Joseph, the earthly father and guardian of Christ, is shown on the right. He is depicted holding a lily and the child Christ. Known as St. Joseph the Betrothed (also, of Nazareth), he was a descendant of St. David the King. He was advanced in years when called to be the Betrothed and protector of the Virgin. In submitting to the fulfillment of the prophets’ foresayings, and in his obedience to God, he is an example of putting the sacred above his own desires. St. Michael the Archangel was the warcry of the good angels in the battle fought in heaven against satan and his followers. Holy Scripture describes St. Michael as "one of the chief princes," and leader of the forces of heaven in their triumph over the powers of hell. He has been especially honored and invoked as patron and protector by the Church from the time of the Apostles. Although he is always called "the Archangel," the Greek Fathers and many others place him over all the angels - as Prince of the Seraphim. St. Michael is the patron of grocers, mariners, paratroopers, police and sickness. St. Michael's Feast day is September 29th. The Pearls Christian Symbol represents the word of God and the the kingdom of heaven. Jesus warned his disciples not to cast Pearls before pigs (Matthew 7:6). Your Blue rosary bracelet will be packaged in a decorative dust bag. It will then be shipped to you in a padded mailing envelope. The package will include "Miraculous Medal Prayer" Card. The actual colors of the St Michael archangel Blue rosary bracelet that you will receive may vary from the one you see on your monitor. All monitors and computer screens are calibrated differently. The same product may appear in diverse colors on different monitors. Terrific item, really happy, thank you so much!!!!!!!!!!!!!!!! !